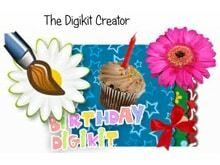 One thing I do, and do well is scrapbook one thing I haven’t done is digital scrapbooking until now! I was asked if I would want to do a review on the Serif Digital Scrapbook Artist 2 software, and of course I said yes! At first I had went on the site, signed up for the group, and downloaded their free version of software and a few kits to start playing with. Not only are their free kits, other kits available for around $4.99 or so. 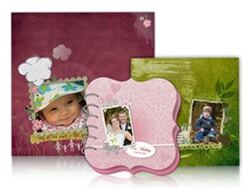 Each kit comes with embellishments, frames, background papers, and alphabets everything you need to complete the page. Plus you are able to change the kits around, and create your own from the stuff you chose. About a week after I downloaded the free software, and completed a couple of layouts, the software came for me to download. The download process was very easy; if you follow the steps you should be fine! The software is set up so that you can do just about anything. I love the ease of use with this, adding items from kits, or the whole kit itself to create your project. The best part of this software is they have tutorials right here on the site, so you can watch and see how to do something! I was able to create 17 layouts with the free kits they had and what photos I have, and I still am not done yet! I can sit here and play with layouts for hours, in fact I have! The software is fun to play with, and fun to see what you can come up with. For the albums, I am used to having a basic album create a page and put the page in a page protector. Digital albums can be done differently, spending a few hours creating an album for your family, and then give them away as gifts for Christmas or birthdays. Find a good company that binds books, I found a number of them when I looked it up and specials to create your own album/book! The site itself lets you share your creations with others, you can go to LyndaJinco at www.daisytrail.com and you will find some of the things I have made and added to my layout album. This software is well worth the price, and well worth the time you spend in learning what it does. If you have no clue what you are doing, start with the tutorials. I found it all very easy to navigate, especially if you have Photoshop experience. I am certainly not a pro with the software by any means, am still looking at the features it does. At this point, I am totally in love with this software, and you would have to force me to use something else. I would love to get the Wacom Intuos4 Graphic Tablet Medium, thanks! I would also like the Wacom Intuos4 Graphic Tablet Medium. I’d like to have the Back to School! Your new button is on my blog. Your event button is on my blog. I like the Pebble beach kit. I would also like to have the 32GB Flash Drive. I also like the pebble beach kit.